This evening was just too tempting: sun, wind and an anxious crew. Bjorn, Calvin and I went for a wonderful sail down Colvos Passage. The wind was out of the south at about 10-15 knots, perfect with a three man crew. 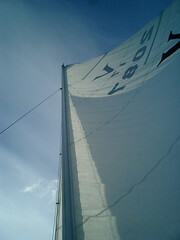 We sailed upwind as far as Pt. Peter on Vashon Island and then turned around. It was a great spring evening on the sound. At school today, the fifth graders worked on their self-designed science experiments. The kids did a nice job of handling things. Hey Peter looks like a wonderful day for sailing! I guess I ended up with a blog also, in an attempt to let Jenny know that we also read her blog up here in Lynden. I don't have time right now to play around with the blog but it might just be fun, I know I really enjoy reading yours and Bjorns! I have got to procure a kayak. All this water and no boat to put on it. Your vessel looks ship shape in the previous post. By the way, I can comment because I am still a member from my short lived attempt at becoming a group-poster on our church blog.